The Test Competition is a special Battle Competition that is only accessible to players who participated in the Black 2 & White 2 2013 Global Showndown competition. Limited registration is available for new Pokémon X & Y players. After completion of the tournament, a survey will run about the best and worst bits of the new regulations. The Famitsu Challenge is a tie in between Pokémon and the Weekly Famitsu magazine. Open to only players in Japan, it runs the standard VGC Rules for 2014. The 2014 April Friendly is a Single Battle tournament held internationally. Only Kalos Pokédex is eligible, with no restrictions so Xerneas, Yveltal, Zygarde & Mewtwo are eligible, and only if they were hatched/caught in Kalos. The other rules are standard: Level 50, 3 of 6 Pokémon in your team eligible, no two Pokémon of the same species, no two of the same item and it keeps the 20 battles a day restriction of the Beta Competition.. The Japan Cup 2014 runs much like the previous Japan cups. Open to only players in Japan, it gives access to the Pokémon World Championships 2014 in Washington DC for those players who rank highly. It runs the standard VGC Rules for 2014. 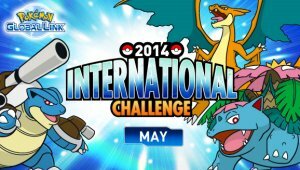 The 2014 International Challenge June runs much like the previous cups. This competition is open to people in all regions across the world and it runs the standard VGC Rules for 2014. The Eevee Friendly makes a return in Generation VI and once again comes within the form of a Rotation Battle. In this battle, you can only use the evolutions of the Pokémon Eevee. Pokémon are lowered to Level 30 and you can battle 10 times in a day. The Super Speed Double Battle is a Double Battle tournament which runs similar to the previous Double Battle competitions, but with a difference: you don't see your opponent's team before the battle. This battle competition also has a specific twist where you only select 3 of the 6 Pokémon in your team. Battles have a time limit of 10 minutes, and a time limit of 15 seconds for each move. This tournament is a Single Battle competition that requires you to use Pokémon that are in the National Pokédex within your team. However, there is a further twist. You can only use Fairy-type Pokémon in this competition, except for Xerneas and Diancie. Pokémon are lowered to Level 30 for this competition. This tournament is a Double Battle competition that requires you to use Pokémon that are numbered in the National Pokédex between 252 and 384, but only allowing one of Kyogre, Groudon or Rayquaza in Battle Box. Pokémon are lowered to Level 25 for the duration.